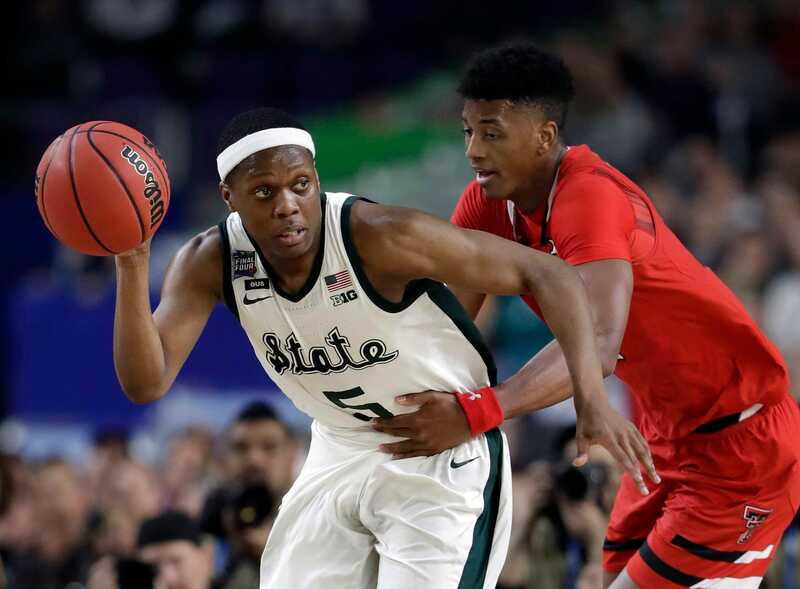 The Spartans couldn’t overcome a 13-point deficit second-half deficit, despite a valiant run on both ends of the floor late in the game, and fell to the Red Raiders in the Final Four, 61-51. Turns out it’ll be Norense Odiase taking the free throws, not Brandone Francis. That winds up being a good thing for the Spartans, as Odiase misses the front end of a one-and-one. Xavier Tillman stuffs Culver; a McQuaid 3-pointer rims out. That would have tied things up. There’s less than two minutes to go. Culver draws a shooting foul. He makes one of two. It’s a 4-point game. Tillman is stripped by Odiase at the perimeter. Woof. Culver drills a 3-pointer. That might do it. It’s a 7-point game with under a minute left. Cassius Winston is at the line to shoot two. He makes both. It’s a 7-point game. Matt Mooney drives on Aaron Henry and gets up a short jumper that falls. Winston draws another shooting foul on the next possession. That’s Mooney’s third personal. Winston makes both again. Somebody get Oprah on the horn: Everybody’s getting a foul call. This time it’s Kyler Edwards fouling Ward, who will go to the line for a one-and-one. Tech appears to have cooled down from the field. It’s missed its last five shots, but the last one draws a foul. Brandone Francis will shoot two. It’s Matt Mooney’s world in Minnesota. He drills another 3-pointer, giving him 20 on the night. Winston answers with a 3-pointer, cutting the deficit to 10. Jarrett Culver comes right back the other end, though, and puts home a jumper. Tech’s lead is back to 12. Tillman hits a 3-pointer, cutting Michigan State’s deficit to single digits. Nick Ward draws a shooting foul inside. He makes the second of two. It’s 32-29, Tech. Matt Mooney misses a jumper. Cassius Winston is then blocked on a drive by Tariq Owens; Owens comes down awfully on either his leg or his ankle. He’s being attended to by the training staff. Somehow, he goes away limping. But he is headed to the locker room, so we’ll keep an eye on that. Brandone Francis gets a big bucket inside. Ward matches it on the other end. It’s a 34-31 Tech lead. Mooney gets to the rim with style, laying in another 2 points. Goins misses a 3-pointer. Not a good game for the hero of last week’s Elite Eight matchup with Duke. Ward makes a nice move in the paint to score again. He’s got five points, all in the last few minutes. Kenny Goins wastes no time getting up his first shot of the half. It’s an airball. Luckily for the Spartans, Aaron Henry is right there to grab the rebound and lay it in. We’re tied at 23. Xavier Tillman can’t convert inside nearing the end of the shot clock. Mooney misses a deep 3 right before time expires. It’s a turnover and foul bonanza. Culver is assessed his second personal with 5:34 to go in the half. Michigan State is in the bonus. McQuaid misses the front end of a one-and-one. That’s six turnovers for the Spartans. Both teams continue to miss. There hasn’t been a field goal from either side in over five minutes. Cassius Winston is awarded two free throws after getting fouled on a drive to the bucket by Davide Moretti. He sinks both, putting Michigan State up, 16-11. The 5-point deficit is Tech’s largest deficit of the tournament. Matt Mooney gives Tech some momentum with a 3-pointer. He then crosses over Gabe Brown, drives to the hole, and hits a pull-up fadeaway in the paint. That’s 5 points in 21 seconds, which ties the game at 16. Nick Ward gets triple-teamed inside, forcing him to get up a poor shot that misses the mark. Michigan State gets a stop at the other end, but is then called for a moving screen, Ward’s second personal foul of the game. Deshawn Corprew throws a pass at McQuaid’s back, which the Spartan senior promptly scoops up and heads down the other way for a tough layup, getting fouled in the process. A converted free throw puts Michigan State up, 9-8. McQuaid then comes off a screen and drills a 3-pointer. He’s got nine points thus far. Moments later, Owens goes crashing into the scorers table, appearing to have hit his head on the barrier. He’ll leave the game with a bump on the head for a second time. Kyler Edwards drills a 3-pointer for the Red Raiders. Winston then gets to the hole, hitting a runner that’ll put the Spartans up by 3. Matt Mooney immediately tries an alley-oop to Tariq Owens, but it’s just out of the reach of Owens’ grasp as he elevates toward the basket. Matt McQuaid gets Michigan State’s first shot, it’s a very deep 3 with an expiring shot clock, and it bangs its way home. Spartans up, 3-0. Norense Odiase picks up an offensive rebound. He kicks to Owens, who immediately ties the game with a 3-pointer. Kenny Goins turns it over, which leads to Jarrett Culver drawing a foul. He makes one. It’s 4-3, Tech. Aaron Henry takes Michigan State’s second 3-pointer. This one also falls through. Spartans back on top, 6-4. Brandone Francis ties it up two possessions later with a bucket inside. Xavier Tillman turns it over on the other end. That’s two turnovers for both teams.